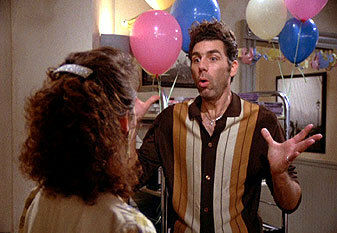 "The Baby Shower" is the fifteenth episode of Seinfeld. The episode was the tenth episode for the show's second season. It aired on May 16, 1991. Elaine holds a baby shower for a friend at Jerry's apartment. George is excited, because he finds the baby shower to be the perfect opportunity to "tell off" the woman who gave him "unequivocally, the worst date of [his] life" by pouring Bosco chocolate sauce on his red collared shirt during performance art. These plans prove unsuccessful, as he cannot muster the courage necessary to do so. Ironically, a woman at the party does to Jerry what George had planned to do. Meanwhile, Kramer tries to convince Jerry to pirate cable television to watch the Mets home games. When the Russian cable "providers" show up, they ruin the shower. The episode was the first episode written by Larry Charles, who remained with the show through the fifth season. He left his mark on the episode by including the "bloodshed and mayhem" scene that "killed off" Jerry, via dream sequence.